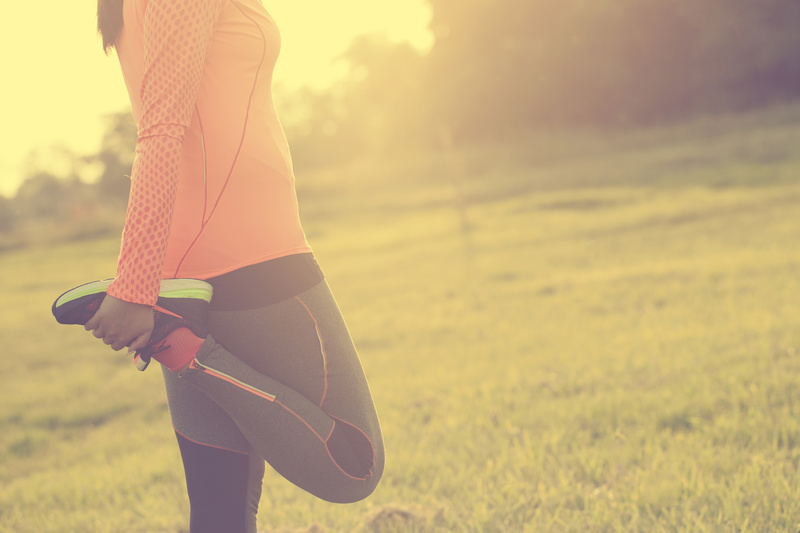 Getting healthy and taking care of our bodies has become the focus for more and more women in recent years. So today, we're bringing you a variety of motivational new products, designed to inspire, encourage and uplift. We can cheer each other on in style, with this fabulous lineup of new stamps and dies! These female athlete silhouettes are designed in both solid and artistic scribbles to be used alone or layered. Mix and match them in darker ink colors over the various decorative layers that not only ground the images but also allude to the concept of movement. Works beautifully with the "Making Strides" sentiment set. She Moves will be available for purchase on December 15th. She Moves contains a total of 13 images. The woman standing doing leg stretches measures 3/8" x 1-3/8". The woman running measures 7/8" x 1-3/8". The woman lunging measures 1-1/8" x 1". The pain splattered decorative layer measures 4" x 2-1/8". The scribbled decorative layer measures 2-3/8" x 1-5/8". The three line decorative element measures 1" x 3/8". The triangular scribble measures 7/8" x 3/8". A coordinating die collection will be available for sale separately, retailing for $3. This collection includes a total of 3 dies. Running: 1 3/8" x 1", Lunges: 1 1/8" x 1 1/16", Stretching: 1 7/16" x 7/16". Making Strides is a sentiment set designed for encouraging someone while they work toward a fitness goal or as they endeavor to overcome a challenge. These greetings offer inspiration, reassurance, and an uplifting message when someone might need it most. Pair these sentiments with a sports-related set to personalize your projects for an athlete or use them on their own for a more universal message of support. It’s never been so easy to cheer on your favorite people! Making Strides will be available for purchase on December 15th. Making Strides contains a total of 10 images. The “Physical strength…” sentiment measures 2” wide by just under 1” tall. The “Progress is progress…” sentiment measures 2 1/4” wide by 2/5” tall. The “…dreams into plans” sentiment measures 2 3/4” by just over 1/2” tall. The “Run with your heart…” sentiment measures 1 3/5” wide by just under 1” tall. Add a bold statement to your next project with these paint strokes featuring clever and unique sentiments. Add more than one, or let a single phrase take center stage. A great way to keep your cards down to a single layer or two, while still being able to add a pop of color. Stroke Speak will be available for purchase on December 15th. Stroke Speak contains a total of 8 images. Each sentiment stroke measures about 3-3/8" x 1/2". This new concept from Betsy has so many possibilities, you are sure to have lots of fun experimenting with them You can use the thin versions alone, or mat them with the thick version. You can also cut out the thin version from the thick version with some careful die placement. Thick & Thin: Hello die collection will be available for purchase on December 15th. Thick & Thin: Hello contains a total of 2 dies. Thin: 1 5/8" x 2 3/4", Thick: 1 5/8" x 2 7/8". 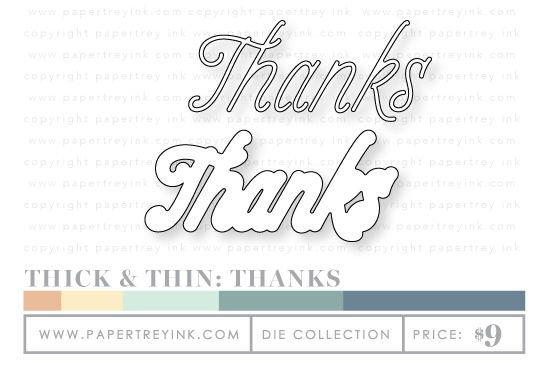 Thick & Thin: Thanks die collection will be available for purchase on December 15th. Thick & Thin: Thanks contains a total of 2 dies. Thin: 1 7/16" x 3 1/4", Thick: 1 9/16" x 3 3/8"
Thick & Thin: Celebrate die collection will be available for purchase on December 15th. 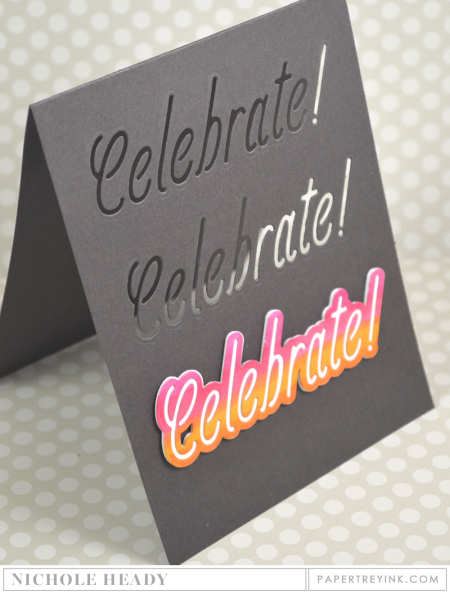 Thick & Thin: Celebrate contains a total of 2 dies. Thin: 1" x 3 1/4", Thick: 1" x 3 1/2". I love how Betsy designed the new Thick & Thin dies, they just have SO many options. One unique aspect of the thin versions is that they are designed so none of the interior pieces of the letters "fall out", this makes them perfect for utilizing the negative space they create. 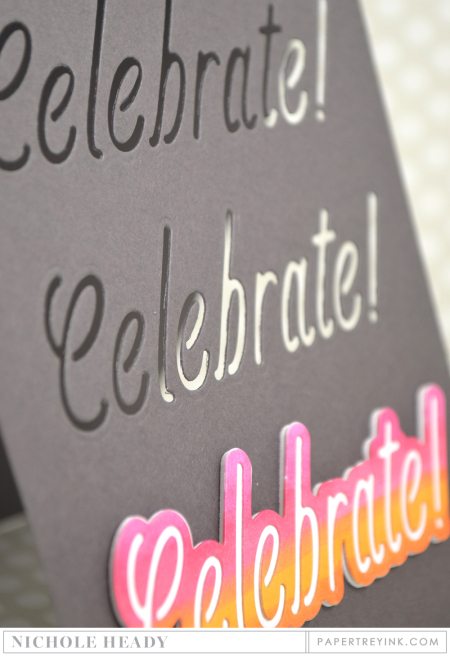 Here I cut the thin celebrate die from my card front twice. It looks so delicate and detailed, yet just involved a simple pass through my die-cut machine! The third "celebrate" at the bottom used the thick and thin versions together. Before cutting the thin design from the thick design, I colored the thick with copic markers, creating an ombré look. I stacked a few plain white cuts of the thick version underneath for dimension. You could use this same technique with any of the phrases and also have fun experimenting with color! My next project used the new She Moves set, paired up with Making Strides. I have SO many friends that are embarking on a weight loss journey as well as participating in marathons regularly, so I know these will be getting a lot of use at my house! I stamped the runner from She Moves a few times in a row without re-inking to create a sense of movement. The stars were added around her using Summer Sunrise ink. I added the sentiment in Simply Chartreuse, and singled out the word "starts" and stamped it in Orange Zest on Summer Sunrise cardstock. This helped to add a bit of balance to the overall design. This was quick and easy to make, and the sentiment could be changed out for almost any of the option in Making Strides. My last project today uses the new Stroke Speak set. I'm just crazy about this and love how easy it is to use without adding any additional layers to your cards. I stamped the sentiment first in Melon Berry. The bold font choice really shows up will even though it is a reverse image. I used the very ends of a few different sentiment strips to add some splashes of color down the side of the card. A few little clear jewels were attached to help break up all of the horizontal lines. I hope you have enjoyed all the creations that I have shared with you today! Can you think of some women in your life, who would appreciate getting a note of encouragement made with some of these motivational products? Or maybe you can see yourself using these new stamps and dies to make some things to inspire and encourage yourself on your journey to fitness! We would love to hear your initial thoughts on everything we introduced! Please leave a comment on this post to tell us what you think of the new products and you will be eligible to win big! Melissa Phillips will be highlighting Thick & Thin die collection. Dawn McVey will be highlighting Stroke Speak. Laurie Willison will be highlighting She Moves & Making Strides. I have many friends who run. This set is perfect. So many wonderful new stamp sets!! I love stroke speak, perfect for so many different occasions!! What fun word cutouts. I love the strength phrases I’ve seen so far. Can’t wait to see the whole set. Fitness is a huge part of my life (I am at the gym 6 days a week) and I have never seen a company dedicate a stamp set to anything workout-related. This set is awesome! I love the innovation of those word dies! So many options from two little dies! I love your products, and every release just gets better! The bold words will make a nice focal point on cards. I know it wasn’t released today, but the new Floral Spray stamps are so pretty! I love that they can be colored or stamped and each way is just as beautiful! 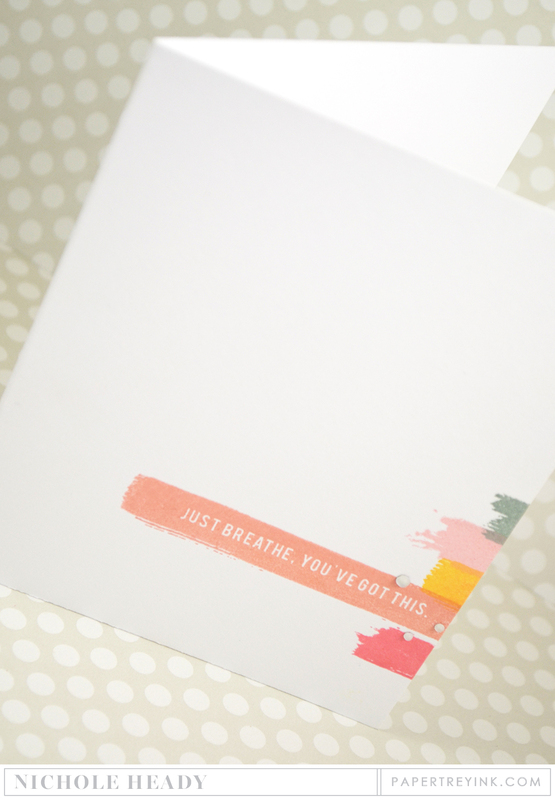 Lizzie’s new stamp sets are so inspiring- just like her journey to become healthier! You have no idea how excited by these sets today! I have been working with a trainer for over four years and these will make fantastic cards for her! I love, love, love them! I love the word dies and the workout theme! Great cards to show off these new items! Love these new encouragement sets. I need them! So many fun things in this December release…especially the thick and thin word dies! Loving the thick & thin dies!! I love how you all are constantly figuring out how to add dimension to cards and paper projects. I know it’s hard to be constantly innovative in what you are offering, but you step up the bar every month!! Love, love, love those double words. I hope the collection grows with each release! I can’t wait to add those to my stash! I’m loving the new Stroke Speak set and the new word dies are yummy too!!!! Great projects from the team! Another brilliant creation by Betsy! I love the Thick & Thin series! Love the new stroke speaks set! Can’t wait to see the whole release! Being on the move is always great. the new word dies from Betsy are a “must have”!!! More awesome stamps & dies! The DT has made it really hard to resist any of these new items. Love them all! Beautiful cards made from great new products! Thank you for all of the ideas! Love the new Thick and Thin word dies and all the different looks you can get with them and also Stroke Speak. Erin’s new set looks like fun! Those word dies are awesome! Great projects today! Fun release, love the word dies!!! As a runner for the past 24 years, I am very excited to see the running stamps and dies. Can’t wait to share them with my runner friends! I LOVE the thick and thin dies. Betsy’s Thick and Thin dies are incredible! So far, I haven’t needed to have any of Maile’s “Splits”, but those roses are making me crazy. I can hardly wait to get my hands on them! Betsy’s “Thick and Thin” words are bloomin genius! And of course, she has designed them to be easy to use – something Papertrey excels at. I’m looking forward to the rest of the release….a bit like opening presents on Christmas every day! The new Thick and Thin dies are a definite “I want”. So clever and creative. I love the word dies and how you can use them with two layers. Such pretty colors and they give such a bold look to the projects. Wonderful ideas. I love the squiggle flowers. Gotta have those. The Thick and Thin dies are a great idea. They’ll make it easier to keep your cards looking fresh and different. Love the fitness set, so uplifting. The double layer sentiments look like a winner for me! I love the thick and thin sentiment dies! So many possibilities. The Thick and Thin dies seem so useful. Stroke Speak is looking to be a great set! Melissa’s cards today were gorgeous, as usual. So wonderful to see Dawn back and I love her color combo today! Love the thick and thin dies!!!! I think the She Moves set is going to be awesome, and what an original way to cut the sentiment dies! Great new set from Lizzie, very inspiring phrases also. Maybe a “He Moves” set will follow? Love the new layered die sets from Betsy too, quite versatile. WOW! She Moves set – is really something new and very interesting!! These look like they are going to be fun to play with!! Stroke Speak looks perfect! Great projects. Stroke sp0eak and the new dies are awesome!! Gorgeous and inspiring projects as always. Love how you can do so many things with the new Thick and Thin word dies, awesome product! Absolutely love the new thick & thin dies! Love the words dies and all the projects! Another awesome day of releases. I love the word dies. They look extremely versatile which is great. The encouragement of the first products are just in time for all the goals of the new year. Great set—–Thick&Thin.Can never have enough word dies! Love the new activity stamps. What a great idea! The new thick and thin dies are great. Love seeing the new ideas. Love the Thick and Thin word dies! Such a versatile set! Thick and thin looks like fun. Love the new word dies!! So versatile! Love the new thick & thin dies! Oh! I’ve got a friend who runs and this set would be perfect for her birthday! Thanks! I am absolutely loving this release! From the different variations of the Thick & Thin dies, different words, beautiful splits, swans and She Moves. Wow, so many different choices! I just love all the inspiration, and love that the Thick & Thins can be purchased separately! Just beautiful products!!! Thick and thin dies are wonderfully unique. I love the new Thick & Thin collection – very innovative! The samples by the DT are awesome, as always! I’ll need the exercise items after the holidays – already ate 5 cookies and ice cream today! Love the thick & thin dies! Fabulous projects today! Love the word dies! So versatile! The Splits with love is just beautiful. Love the samples. The thick and thin dies look great. Love the running ideas! So unique! So, so cool! 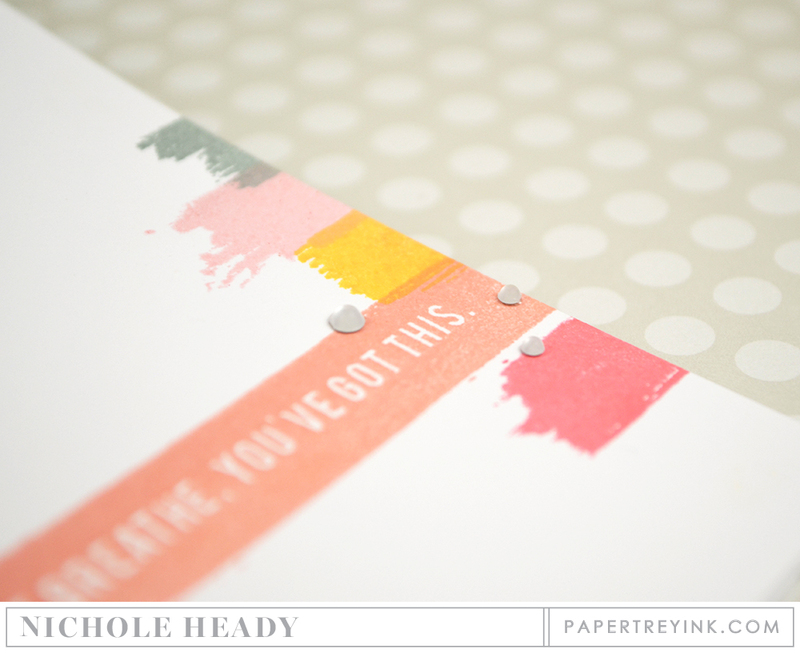 Loving all those Thick & Thin dies, and the awesome encouragement stamp sets looks fantastic. Beautiful design team samples! I’m loving the new think and thin dies. Clearly they make a bold statement! I really like all of the products showcased today. I am especially excited about Stroke Speak! What a great stamp set! I like the stroke speak set! The new thick and thin dies are wonderful. Excited to put them to good use. Those dies are brilliant. And, I really love the other new sets. I need them all. Love the thick and thin dies and stroke speak! Love the new thick and thin word dies!!!! So fantastic! Love the new thick and thin word dies. They are must must owns! Now we need a set with a crafter sitting with stamps and scissors and encouraging words for her “exercise” of sit up straights, lifting, punching, etc. LOL! Really like the script words die sets and beginning to imagine lots of ways to use those. The thick and thin words—— super superb!! Thick and thin works for me. Love the dies! Hello is too cool! Some really original new products today. Love the Thick & Thin dies & all the awesome possibilities they present. Wow! Love the She Moves and the thick and thin dies are so innovative! Thick and Thin dies are a great idea! And will be fun to use with Stroke Speak, too. Thanks for the photos showing all the different combinations of thick and thin. Wow!! Love the health set – very inspirational! Thanks for the opportunity! The Thick & Thin dies are totally fabulous! I totally like the encouragement phrases – thanks for the inspiration ! Love the new word dies! What a neat concept! And I’m super excited about that pretty Lilac color… gorgeous stuff today! She moves looks like it is sized so that I can use it in my planner. Bonus! I love the thick and thin word dies and will definitely be buying some of those!! Oh my goodness – I have been waiting YEARS for stamps, dies, stickers, anything, of female runners. This is an awesome Christmas gift. The thick and thin words are so unique! I have many friends that run so this set will be great. The word dies are too good.. I can’t take my eyes off the inspiration projects!! Love it!! This new release is wonderful!! The new word dies are awesome! Thank you for the chance to win! Oh my I am loving everything in your new release!! Such great new products this month:) The word dies are awesome!! Let’s exercise more and make a card to remind us to do so. Great way to start out the new year! The thick & thin dies are just awesome!! I’m excited about the thick and thin words! Like the hello and celebrate dies. Really loving the sentiments from She Moves! Love the Thick and Thin dies! So fun. So glad to see Dawn is back. Prayers for her. Inspiration for the New Year! Great stamps and dies — especially like the She Moves and the Thick & Thin word dies. So versatile. Love the new Take It Easy set! Love Thick and Thin. Hope there are more to come! I love the Thin and Thick word dies! Just another great idea from Betsy! Absolutely love the thin & thick word dies. Looking forward to more of Heather’s latest stamp sert. What about He moves? I’m crazy about those new thick and thin word dies. I can see so many possibilities. Great release AGAIN this month! Heather’s set is gorgeous – love that wreath and everything with it! Lizzie’s and Nichole’s sets- What powerful words and images of encouragement. Fantastic word dies by Betsy. I’m loving it all! Such fun themes! Great card samples! Oh I am loving today’s post, especially the thick and think Hello, so fun and so so cool! What an exciting release—so many unique and fun sets!!!! This is a really fun set of stamps but I LOVE the new Thick and Thin word dies. They are so COOL!!! I like the celebrate and hello dies. This adds such nice dimension to the cards. What a wonderful idea – the She Moves collection of stamps and die. Love it! I really like the Cozy Bed dies — they’re definitely on my wish list! The Take It Easy set looks like fun, too! I can’t wait to get the new Thick and Thin dies. How versatile those will be. The new thick and thin dies are fabulous. A must have. 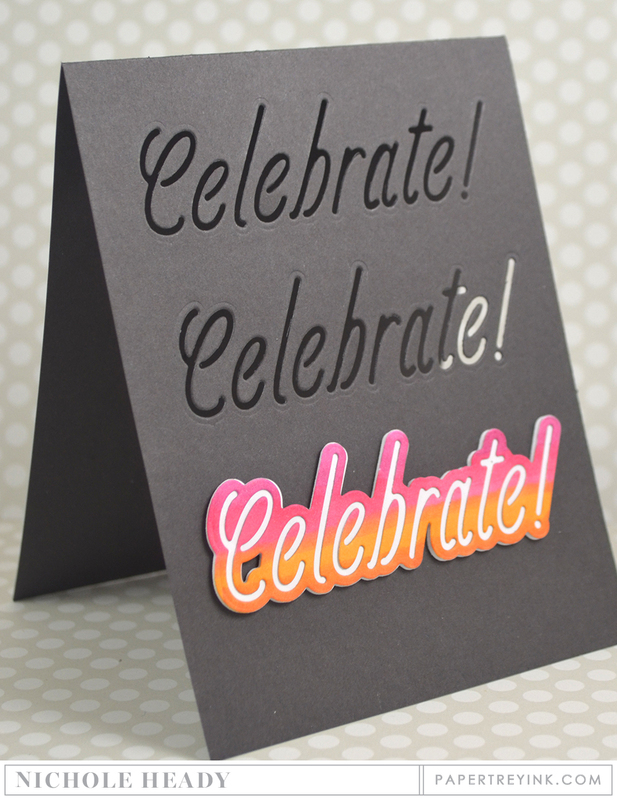 Love the font on those die cuts – what agreat idea having two sizes of the same word! The thick and thin dies are great. This stamp set is perfect for high school track teams! The thick and thin word dies are brilliant! Such wonderful projects on Day 2 of this new release! Love the Thick and Think die words, and the Stroke Speak is awesome, love these encouraging word sets! Stroke Speak is calling me! Really look forward to each release because of the designer’s beautiful work!! My favorite thing today would be the Thick and Thin dies…they work together so beautifully. Great cards DT. Great sentiments from today’s post! Oh wow!!! She Moves set rocks!!! It’s absolutely great for encouraging cards! Love all these cards!!! 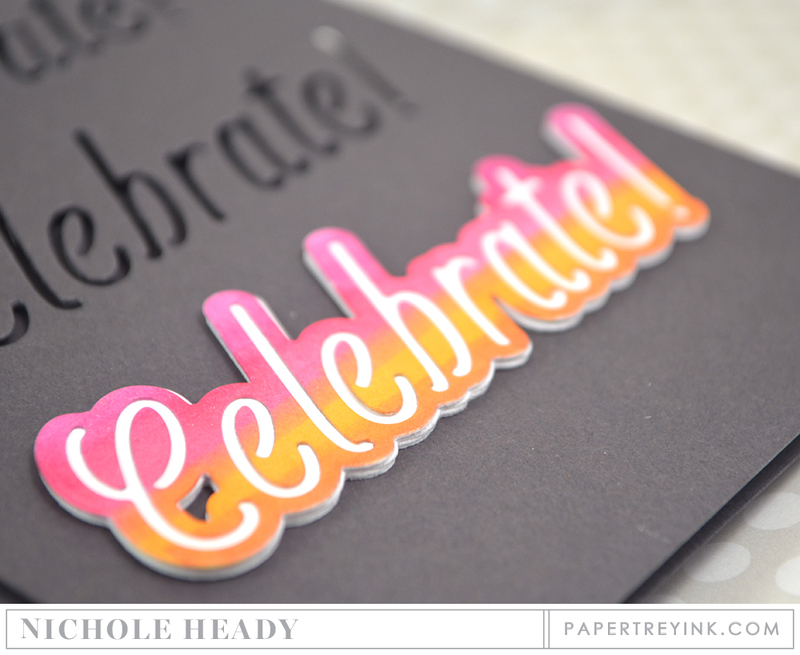 I always love new word dies and these are great with the layered/shadow effect! The new things from Lizzie, are so innovative, and the word dies look awesome! Great projects too! Love the new Thick and Thin dies. And no little pieces to spread through the house, and losing the needed ones! What fun stamp sets–great for card making after Christmas! Absolutely love the new word dies! Cheers. I love how the Thick and Thin dies may used in many ways, including the negative. I love the “Run with your heart, not with your legs” quote! PTI always comes up with the most creative ideas–keep them coming. I am so happy to see the new healthy women themed items! Being healthy is so important to so many wimen, I’m surprised that we haven’t seen more products like this. Great job! Loving the Thick & Thin sentiments and dies! Awesome! I like stroke speak! Having the wording inverted will he a fun way to add color to projects! Awesome new products! Always so on trend and creative ideas and products from PTI! I absolutely LOVE the Thick & Thin Dies and the versatility they offer. Ladies have made some beautiful projects. She moves is a set of wonderful inspiration! Wonderful release. I love large diecut sentiments esp. ones you can layer! The layered word dies are very cool! Two more innovative products from PTI – I have not seen anything like “She Moves” from any other company, nor have I seen that kind of ‘nesting’ type word die. Way to go! Love the word dies!! Can’t get enough of them! She moves is very innovative. Such great new products. Love the new thick and thin word dies. The Thick and Thin word dies caught me by surprise, what a fun way to add interest to a sentiment! I love what we have seen of Stroke Speak, and as my son is a marathon runner Making Strides is sure to hop in my cart! Looks like yet another fantastic release! Love, love, love the fitness sets! My daughter is a marathon runner and I’m always trying to find ways to encourage her. These sets will be perfect!! Just when I thought I had all the sentiment words dies I needed, you came out with the very fun thick and thin word dies. I love how many ways they can be used! The new Stroke Speaks set looks very interesting and I’m looking forward to the full reveal. I love the She Moves set, too, just not sure it will work for me as my exercise basically consists of running up and down 2 flights of stairs and doing chores (yuck!). Love all the inspiration this month!! Betsy’s new die cuts are marvelous. Love the look of Stroke Speak and how uplifting the Making Stride sentiments are. Beautiful projects. The word dies are great! Lots of fun! She Moves would be great for motivational and encouragement cards! Health and fitness is Big, great choice on a fitness die! Such great projects today from such a unique set of materials. PTI always sets the trends, in my opinion. Great release so far! Love the double-layer option for the Thick and Thin set! Thanks for all these cool projects! I love what I’m seeing, as always! The two layered sentiment dies look super beautiful! Great design idea! The thick and thin dies are a great idea. It’s a fabulous way to get layers of color. What a unique selection of new products! 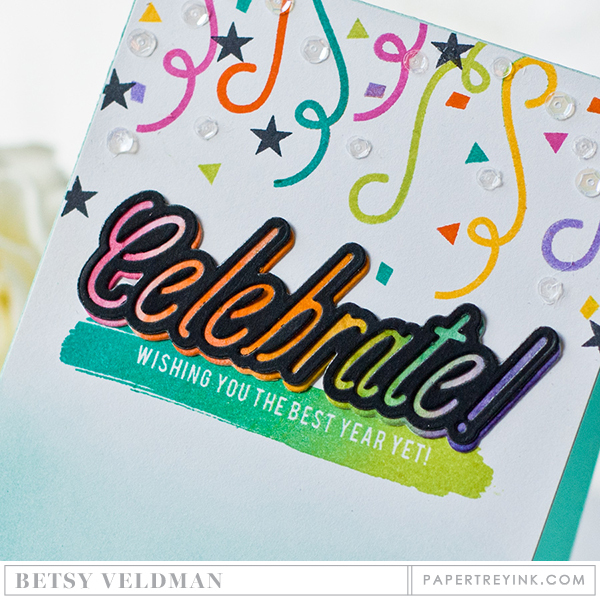 Betsy’s new words dies especially caught my eye as a must have – so much versatility built into them! Love Thick & Thin! I think that it will make a great addition to my craft collection! Love the new thick and thin dies. Loving the new Thick and Thin dies from Betsy. Lovely projects by all. Love the new Thick and Thin word dies. Love these new thick & thin word dies. They really look great using two different colors of card stock. Loving the new Thick and Thin series, they are so versatile and will be fun to use. Great projects! Love the thick & thin dies – another stroke of genius! Love those new word dies! love the thick and thin! Loving the new word dies & Stroke Speak is fabulous! Beautiful cards! These new stamp sets are really nice! How fun! Love it all! So many fab goodies in this post and I love what everyone came up with! Topping my wishlist right now is the Thick & Thin Hello…. LOVE it!! Those thick ‘n thin dies are kinda cool – nice way to make gender neutral cards for your stash. I am just loving the She Moves and Making Strides sets! I don’t have anything like them in my collection. The thick and thin die series is the winner today in my opinion. Great job! The thick and thin dies are great! The Fresh Bouquet and Splits: Love are wonderful! Love the DT projects! Loving the new stroke speaks set! and how i wish that running set was out when I coached Girls on the Run…perfect! Love the projects! The new word dies are awesome!! Oh what an amazing release this is going to be! I love the thick and thin dies…wow! As usual the florals win my heart , but the runner and mover silhouettes are just right for my in shape friends. I LOVE the Thick and Thin dies! There are so many design possibilities with these. Thanks for the chance to win a gift certificate. Beautiful cards! Love the thick and thin word dies, so versatile and unique. I really like the new think and thin dies! What a nice selection of stamps today! I am looking forward to seeing the whole paint swoosh set of sentiments! The thick & thin dies look awesome, lots of possibilities. And will I lose weight if I buy “She Moves”? Maybe? LOVE the thick and think layering dies! Clever! Great products. Thank you for the opportunity to win. I love it when you have a die set that can be used in more than one way. The new “Thick and Thin” dies are awesome! I hope that there will be more sentiments coming. Love the thick and thin word dies! Those thin and thick dies look very intriguing! 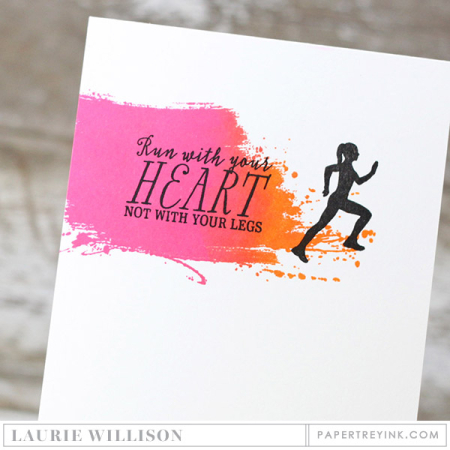 I love “she moves” stamp set…amazing inspiration! I have become obsessed lately with stacking sentiment dies. Love these new ones. One of the things I get frustrated with are die cuts that fall flat. These new word dies are anything but! Great idea, love them!! The word dies are wonderful! Love the new thick and thin dies! So versatile! Love the Thick & Thin dies and another gorgeous floral set, Fresh Bouquet. Can’t wait to see the rest of the release!! The Take It Easy and Cozy Bed dies……yippee! They will be mine. Love betsy’s twist on word dies with”shadows”. Lots of sweet combos! Like the look of the thick and line dies. Loving the thick and thin dies. So unique and so many options. Love the exercise-themed sets! I love sets with encouraging words about working through stuff when it’s hard. I also love the sporting images that aren’t football! Hello thick and thin for the win! Love the look of the layered word dies! Another great release, it seems. Love everything!! Fun new products and wonderful inspiration! Fun products! Great inspiration projects! A runner I’s not but do like the set. Still love the floral bouquet! I like the thick and thin dies. They look very clean and stylish. Stroke Speak looks like a great new sentiment stamp set, love it! The Thick & Thin dies are great. Those thick and thin dies are gorgeous! I love the Stroke Speaks set. Get work everyone! I love the word dies especially on Melissa card! I really like the word dies. The thick and thin dies are cute! Love the she moves, & stroke speak sets! The Thick & Thin series is a great idea. I’m looking forward to seeing Making Strides. This will get a lot of use. Really like the new thick and then dies! I love the new word dies!!!! Just what I was looking for!!!! Love that “run with your heart…” Sentiment!! Fabulous cards! This release looks like it will be another great one! Such great products showcased today! Love the new Thick and Thin dies! Love the new workout-related stamps and dies. Great idea. I am loving the Thick and Thin dies, There are so many ways to use it. I hope there will be more. Love the Thick and Thin dies!!! Motivational sets for exercising is just what I need! Wow, what a great idea. I love the running. And love the word layer dies. I love the new items! Very cute. I really like the look of that heart wreath! I’m loving the new stamp and dies. The design team is so, so creative. She Moves and Making Strides are at the top of my wish list! I love them both! Super fabulous projects today!!! So much wonderful inspiration…love those new word dies. Those sentiment dies look great! The thick and thin dies are genius! 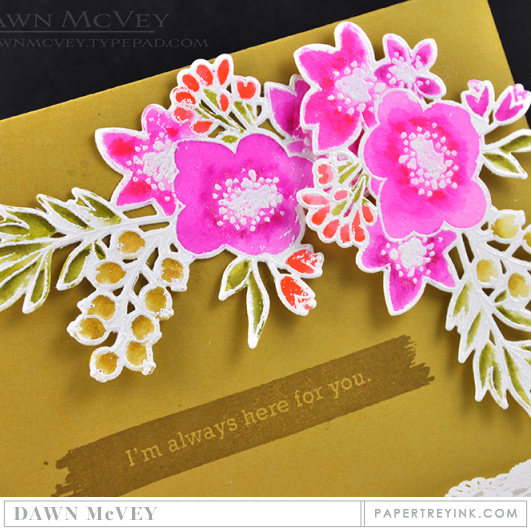 It’s great to see Dawn back, having fun, making cards. I’m very excited about the running stamps! Love the new Thick and Thin dies–great concept! I really love those Thick & Thin dies! Love the thick and thins! So many possibilities. Love all the new stamps and dies so far,the workout dies are fabulous, but I really like the new thick/thin dies, very clever. I am liking the Thick and Thin dies very much. So glad Christmas is coming soon. Thick and thin sets look awesome! Beautiful projects today! So cool and lovely! Thanks for the chance to win! I cannot tell you how long I have been waiting for a running/fitness set. Running is a passion of mine and there are so many lovely people I would love to encourage with a beautiful card. This really is the most wonderful time of the month! I love Lizzie’s new set. I’d like to see one for men too! The thick and thin dies are fantastic. What a great bunch of new goodies. I really like the fitness set and the brush stroke sets, but I really love the thick and thin word dies. They’re like WOW!!! So versatile, they’re really fantastic. Can’t wait. I really like those thick and thin dies- the neon light look with them is phenomenal! I think these are going to be my new all time favourite PTI products. Those Thick & Thin dies are SO COOL!!! I love how many different ways they can be used! And the She Moves and Making Strides dies and stamps are so original. Really excited for release day! Love the new sentiment dies!! Thick and thin word dies – I never knew I needed these but now I just have to have them all. Brilliant! Great new motivational products. Loving the She Moves dies and the words… the thick and thin dies are amazing… great look! what fun new products today… the word dies are so clever! Wow, some awesome new ideas! She moves, for all the runners in my life, would be awesome. Love the layered die cut sentiments. Love the Thick and Thin dies! So many options and different ways to use them. Great projects! Love the word dies! I really like the new Thick & Thin dies. What a neat concept! And I sure could use the new sentiment set – great idea, Lizzie! Love the projects! The new dies are fabulous! The new stamps “She Moves” and “Making Strides” are awesome and so missed from the Card Making scene! Love the Think and Thin words too! Thank you for all the fabulous inspiration from you and the DT. Asked for a Papertrey Ink gift card for xmas so The Thick and Thin dies are going on my Wishlist-yippee! I love the Thick and Thin Sets, so many options! Love the thick and thin word dies and all the possible combinations. Wonderful projects! How fun are these new stamps! What great designs! Excited for these to come out! the Thick & Thin dies are great. must haves. I love the word dies! The Celebrate card sold me! What a lovely set to send to someone who is into fitness. Adorable! Really looking forward to the thick and thin sets!!! Great projects today!Loving the new encouragement sets! Love the thick & thin dies! Love all the word dies! The fitness products are great for the new year. I love the new thick and thin dies and stroke speak. I love the new thick and thin word dies and how you can get different looks with the same dies. Thick and thin die collection, great idea! Love the font too. Love the new word dies! I really like the thick and thin die cuts. The thin and think dies are genius. I love how they interlock with each other. I have a lot of friends who run, too, so that set will be used a lot. I love the word dies & the new sentiments. I’m addicted to anything brushstroke or splatters – so today is a good day! Wow love all the projects. I run every day, so I’m loving the runner dies!Very fun. The Stroke Speak is very cool too. those word dies are amazing…I love the possibilities! Another fun day of projects! The fitness sets are a great addition and I also love Betsy’s new word dies – so clever! Love the possibilities with the She Moves set, very cool! So glad to see She Moves and Making Strides…for me and my running group! I really like the Thick and Thin word dies. Very cool! The DT is awesome. Their creations make me want it all. I love the encouragement that the Making Strides stamp set offers. Super excited about these!! I really want the new word dies. So many creative tricks with the Thick and Thin dies. Can’t wait to see more! Love the Thick and Thin dies…..these are awesome. Can’t wait to see more of the fitness set. My daughter stays very active. This will be a great set to use for her. Loving the thick and thin dies- AMAZING! Totally loving the Thick and Thin dies! Can’t wait to see more of those in the future! Thank you for showing all the ways to use the words. Who new? Great sets! The Making Strides set is perfect for encouraging friends. I can’t wait to get it! I love the concept of the thick & thin dies! Oh, neat products! Love the thick and thin dies! The thick & thin dies are so neat! So many great products, so little money lol. Love all the new release items. Thanks for the opportunity to win. Love the the and thin dies! I love the Thick and Thin dies! Such a clever design. And thank you for the inspiration. Love so much of today’s new items! The word dies are so fun. Love the versatility of them. I also like the She Moves. Perfect my coach friends. The thick and thin dies are fantastic!! I love that Hello die! So clever! I love the word dies and the she moves set, can’t wait to see more. Love the versatility of the word dies. Can’t wait to order them. 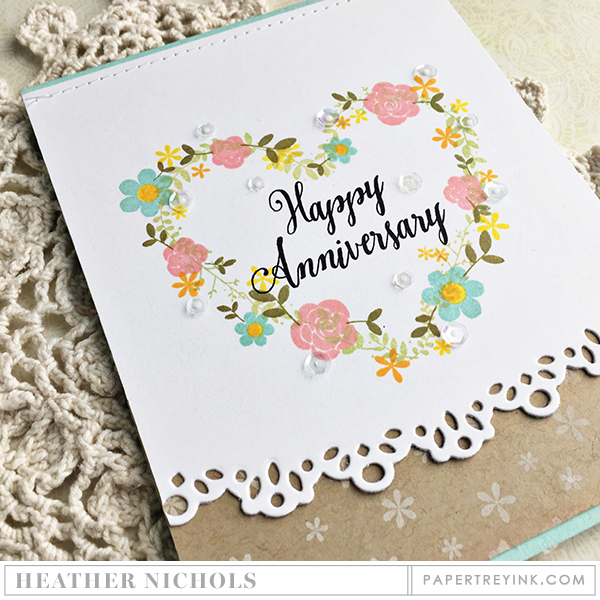 I love the Hello dies and the beautiful sketchy flower stamps> Great cards that you all shared!! The thick and thin dies are intriguing and I really like that cute running gal! The Thick and Thin dies are awesome. Really could do alot with the word cutouts. Know runners that the other items would be perfect for. 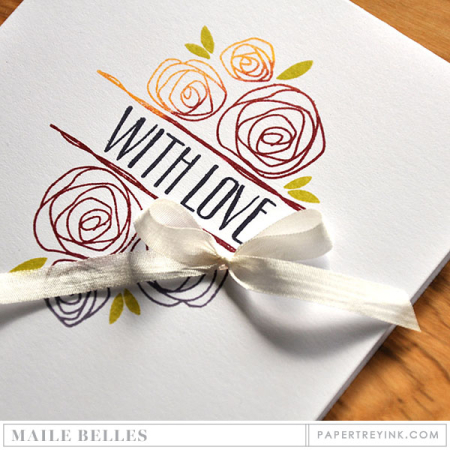 The word dies are a must have…..i love how you ladies layered and inlayed the dies….brilliant! As always, such wowing projects made with amazing sets! The new fitness-themed sentiments are great – such good choices! Where oh where was She Moves when my daughter ran track! So many great products in this release! Love the thick and thin dies – definitely on my shopping list. So adaptable, so many possibilities. Love that Celebrate card! The Thick and Thin dies are so cool! I love the new Thick & Think word dies! Those word dies are so neat! Great running theme. Oh my goodness- I am so excited about the She Moves set and the sentiment set! Thank you for creating something to fit in this niche! She Moves is very unique! Another great collection of sample cards from you & the design team! Today my favorite set is Making Strides. Thanks for all of your inspiration! Those word dies are so interesting, different from anything else I’ve seen out there. I love the new thick and thin dies! Great projects Ladies! I’m excited about the new thick and thin cuts! So many possibilities! Love these dies with shadows! I love these! Wonderful designs! Clever uses of the word dies. TFS! The Thick and Thin word dies are fantastic with all the different looks you can get out of them! LOVE the new stamp sets!!! Those word dies are SO AWESOME!!! Love the Thick and Thin dies! And so inspired by the many ways to use them! Love the word dies – I love it when you can do many things with limited supplies – these are the answer! Very cool products! The thick and thin dies are amazing! 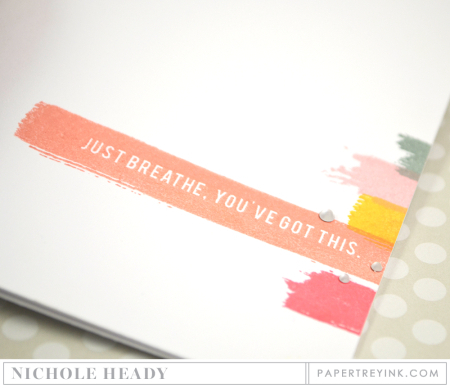 The She moves dies are great with the inspirational stamps! Another great release! The DT keeps it coming. Thanks to all of you. SO MANY of my girlfriends are facing challenges these days. THIS set will speak to them…the timing could not have been better. LOVE the new word dies (how clever is that Betsy Veldman!) and Stroke Speak! I really love all these inspirational sets from PTI. No other company seems to hit it out of the park! love the new word dies already! Love the big words, they make great quick cards. Love the Thick and Thin Word dies. Thanks to all for sharing their lovely creations. I’m so excited about these new dies!! And I know I’m going to get a lot of mileage out of the New Strokes set! I love the look of the Thick and Thin dies? Well, I’m a runner and have lots of runner friends, so this set is probably a must-have! Great projects today! The Thick and Thin dies are fabulous! Love the new work dies! Love the word dies and multiple combinations! Incrediblecword dies! And very inspiring stamps too! I love the new thick and thin dies. She Moves is the coolest, most original set, ever! OMG, for all my athletic gal pals. Gorgeous products & projects! Love the new word dies! ? 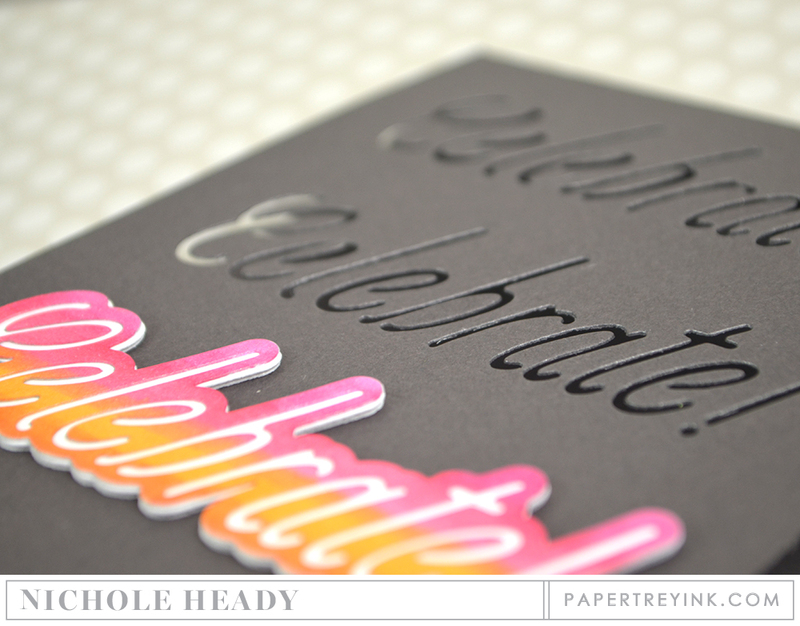 I love the thick & thin word dies – a great addition to my collection! Also, can’t wait to share, with my loved ones, the cards made with the stamps and dies. I love those word dies. Such great project ideas! The new think and thin word dies look like a lot of fun and seem to have a lot of versatility. I also love the inspirational saying in the making strides and stroke speak stamp sets. One can never have enough word dies. Love them.